Rivers and lakes of Yellowstone National Park area - the Yellowstone River, the Madison River (and Hebgen Lake), the Gibbon River, the Snake River (Henry's Fork and South Fork) and Soda Butte Creek. Rivers and lakes of Rocky Mountain National Park - the Fall River, the Big Thompson River, Lily Lake, the Colorado River. Melrose is a 'blink and miss it' town in Montana situated between the larger conurbations of Dillon and Butte. It's all about flyfishing, and the flyfishing hub of Melrose is the Sunrise Fly Shop co-owned by Eric Thorson and Ryan Barba which sells tackle and licenses, dispenses fishing advice and expertise, and provides a comprehensive guiding service for the top rivers of the area, namely the Big Hole, the Jefferson and Beaverhead Creek. They can also arrange guiding further afield and offer hosted trips to Argentina. We arrived in late August to the worst drought in 10 years. 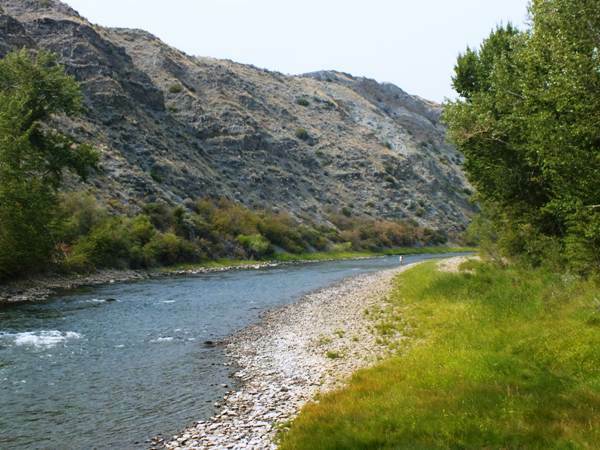 Some sections of the rivers were closed while the Beaverhead Creek was judged to be unfishable due to low water and the resulting high temperature of the river. Given the choice we would always opt for too-low rather than too-high water, but extreme conditions are challenging and make the services of truly knowledgeable local guides even more important in order to get the best out of your fishing. We fished four sections of the Big Hole, each so different that they could easily have been four different rivers, and we also drove to meet a local guide who specialised in fishing the Jefferson River. This beautiful 155 mile long river runs from Skinner Lake in the Beaverhead Mountains, close to the Idaho border, and eventually flows into the Jefferson River at Twin Bridges. The four different day floats were Divide Camp Ground to Maiden Rock 1, Maiden Rock 2 - Melrose, Glen to The Notch, and Jerry Creek to Greenwood Flats. Our Guides were Rick Rossi, Chuck Page, Ryan Barba and Eric Thorson. As soon as we set off from Divide Campground it quickly became apparent that our guide for the day, Rick Rossi, knew exactly which tackle setups were required for each of the immensely variable fish lies we encountered on the float. Despite the lack of water Rick knew where the fish were likely to be holding up until the low-water conditions improved, and we had a steady start sharing around 10 fish which were a mixture of browns, rainbows and mountain whitefish. Without doubt the most spectacular hour of the day (between 11am and midday) was during a Trico hatch of such density that breathing in too hard presented a major health hazard. The result of this phenomenon was a large pool 'boiling' with fish that proved to be predominantly brown and rainbow trout. To say that accurate casting and delicate presentation of the fly was essential in order to catch these fish would be a laughable overstatement - chucking the fly into the 'cauldron' of fish and reacting very fast was sufficient to yield astonishing results. 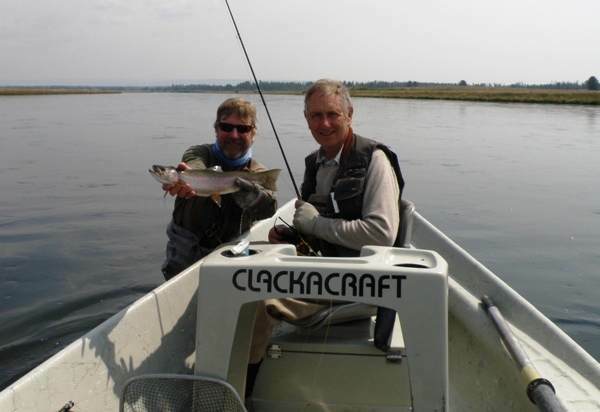 Moving on to calmer conditions, flyfishing skill and knowledge became more important. Rick adjusted the leaders and flies to suit a variety of calm pools, deep holes and riffles, which ensured that we were offered a steady stream of opportunities to land yet more brown and rainbow trout as well as a fair few of the native whitefish, despised by some but loved by us for the dogged nature of the fight they put up before facing the inevitable - Rick with the net. 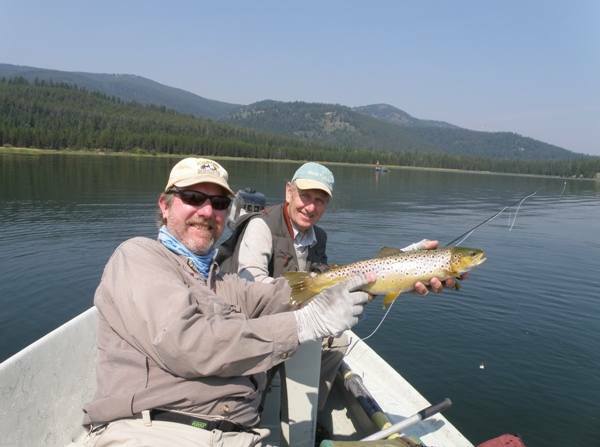 On day two our guide was Chuck Page, a veteran with 25 years guiding experience on the Big Hole and a dryfly fishing expert. In many ways this second float on the river was the most challenging for managing the raft in the low water conditions. It required much decamping from the boat in order to either push or drag the vessel over rocks and shallow riffles. It was, however, no less successful in terms of fishing. The most productive parts of the float were the riffles at the heads and tails of pools, where a dryfly with nymph dropper produced some excellent brown and rainbow trout along with several whitefish. In low water conditions this method of fishing is extremely effective and undoubtedy increases the catch rate for all species on the river. On day three we set off with Ryan Barba in control of our destiny on a yet another very different part of the river. This float featured many deep holes where the larger fish were lying, waiting for the long overdue rain to extend their food-hunting territories. With two rods set up for each angler, one with a dry fly/dropper and the other with two or sometimes three nymphs in a line below one anther, we were armed for all eventualities. Both setups came in handy but, in the low water conditions on this particular float, it was the three-nymph rig that produced the biggest fishfriom the deeper pools. Casting a rig like this is as challenging as casting a streamer; it requires a long wait on the back cast, but learning this skill will increase success considerably when conditions are less than ideal. Our final day on the Big Hole, when we floated from Jerry Creek to Greenwood Flats with Eric Thorson, was by far the most challenging from a fishing point of view. 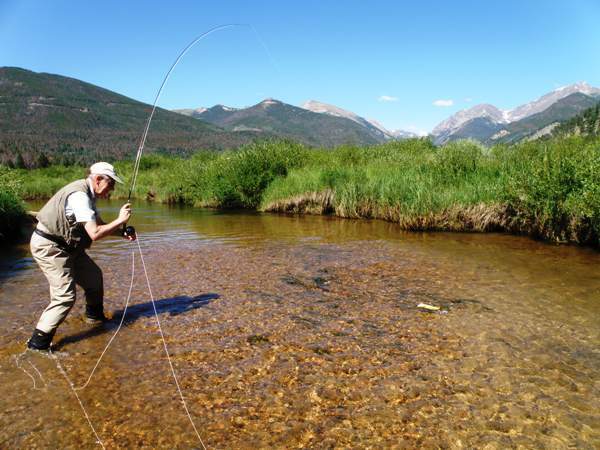 It is such difficult days that teach you most about the art of flyfishing. Eric's knowledge of the river paid dividends, and his persistence and patience paid off, especially when we were fishing the narrower channels of the pool tails where the water was deeper and had a higher oxygen content, both of which are essential to the survival of fish in low, warm water. Fish the right spot, get the fly deep enough, and you find the fish! The Jefferson River rises in the Rocky Mountains and is a tributary of the Missouri River. After driving over to Twin Bridges (around 17 miles from Melrose) to meet fishing guide Joe Cummings, we floated from Parrots Castle down to Mayflower. The Jefferson River is very different from the Big Hole and has been the subject of a conservation programme in recent years to restore the river to its former glory as a trout fishing destination. The boat launch spot at Parrots Castle reveals the remains of some of the numerous pumps which had been used to abstract water for agricultural purposes and which brought the river to its knees. 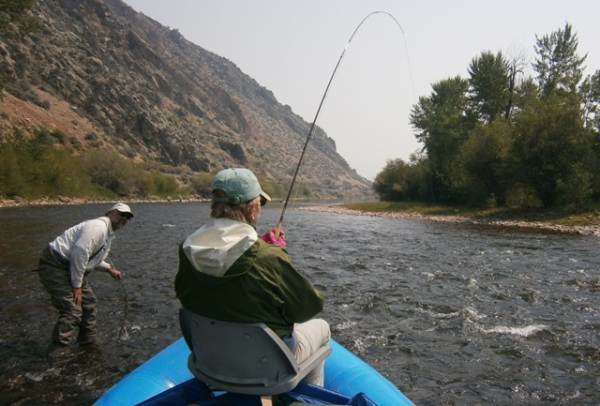 Today the Jefferson is a top-grade angling river and protection continues through the auspices of The Jefferson River Watershed Council, who coordinate community efforts to protect and conserve the river's natural resources. Within a few minutes of rowing the scene of the old pumps is replaced by one of the natural beauty of the river and its wonderful wealth of wildlife. We can confirm that the restoration initiative has paid off: we each caught large numbers of brown and rainbow trout along with some chunky native whitefish. Joe is the kind of fishing guide who causes you to question whether the division between fish and humans took place rather more recently than the generally accepted evolutionary tree of life would suggest! He certainly 'thinks like a fish', and we had wonderful day of trying out the kinds of tactics that cause fish to explode from various lies in pursuit of our flies. Our fishing stretch consisted of wide braided flats, bends with deep pools, and plenty of riffles. In the low-water conditions it was the pools and riffles that provided the best sport on our day with Joe, under whose guidance we fished using various tactics including big dry/heavy dropper set-ups that were particularly effective in the faster water and deep pools. 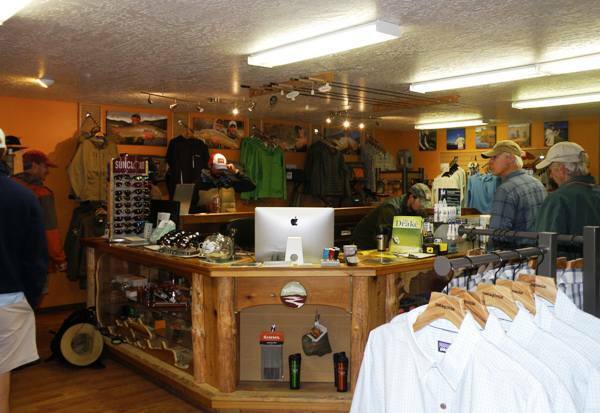 Sunrise Fly Shop - situated in Melrose on the main road between Dillon and Butte. 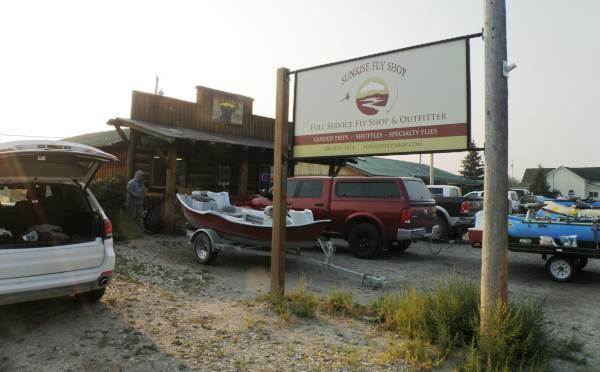 The Sunrise Fly Shop sells tackle and licenses and provides a full guiding service for the Big Hole, Beaverhead Creek and Jefferson Rivers as well as rivers further afield. Although there are self-catering cabins and homes available in the Melrose area, it is worth noting that the nearest supermarkets are close on 30 miles from Melrose in either Dillon or Butte. Great Waters Inn offers excellent accommodation in cabins adjacent to a main lodge building that includes a lounge, bar and restaurant. Lodging is provided on a full board basis removing the need to spend time on the 60 mile return journey to buy provisions in the nearest food stores. 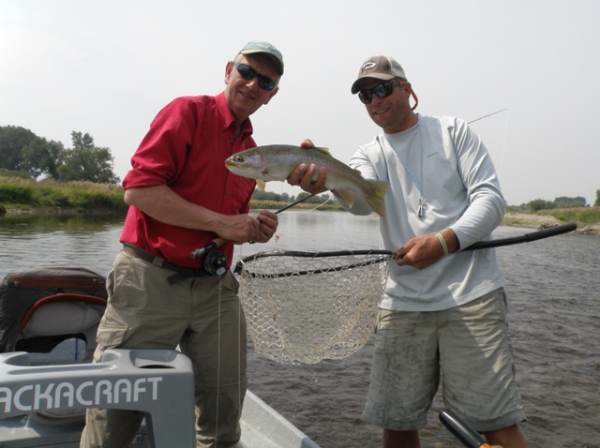 The lodge also has direct access to fishing on the Big Hole River. Melrose boasts a single restaurant which is conveniently situated next door to Sunrise Fly Shop. 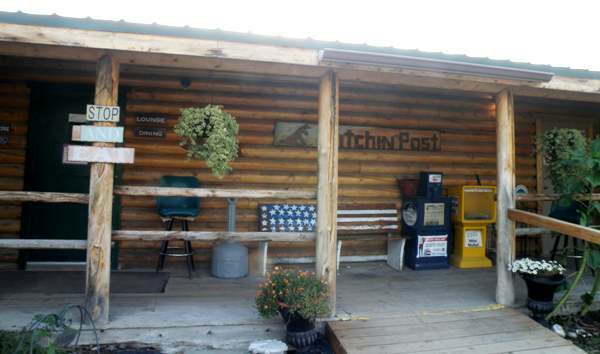 Open from 8am to 10pm, the Hitchin Post restaurant has a lounge, bar and separate dining area. Despite being the 'only show in town' the quality of the food and the service would lead you to believe they were competing with hundreds, and far from feeling like a captive audience we looked forward to trying a different dish each night of our stay. Never once were we disappointed. Yellowstone National Park is a vast forest covering nearly 9,000 square kilometres. Most of the park lies in Wyoming, with just 3% in Montana and a mere 1% in Idaho. Half of all the world's known geothermal surface features lie within the Park, with 300 geysers (two thirds of all those that exist on our planet) and countless hot sulphur springs. Established as a National Park in 1872, Yellowstone is famous for its wildlife, including bears, wolves and bison, and for the wonderful rivers and streams in which it is possible to fish for trout and grayling during the summer months. The Gibbon River rises in the centre of Yellowstone National Park from Grebe Lake. It flows through Wolf Lake and onwards through the beautiful Park scenery until it is joined by the Firehole River (probably Yellowstone's best know rivers due to its many geysers) to create the start of the Madison River. 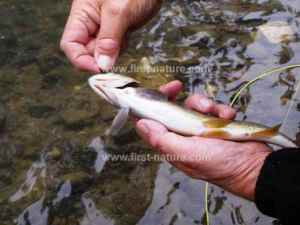 The very topmost section of the Gibbon is difficult to fish due to the steep wooded terrain through which it flows, and the fish there - brook trout, cutthroats and the occasional grayling - are generally rather small. 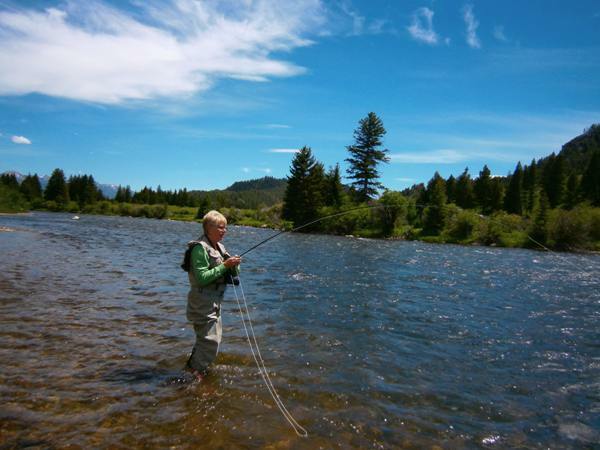 Two of the lower sections of the river offer excellent flyfishing, however. The first of these is the calm and slow-flowing section that runs through The Meadows, and the second is a much faster stretch below the spectacular Gibbon Falls. This lower section is home to a good population of rainbow trout, while the slower meadows section is home to wild brown trout some of which are quite sizeable. Both sections are easily accessible with good wading. Light tackle (AFTM #4 or #5 rod) and fine tippets are essential on the gentler stetches such as Gibbon Meadows but less important on the brawling lower reaches. Distance casting is not essential, but on the quiet pools it is crucial to cast accurtely because lining fish is fatal as far as success is concerned! Dry flies and small nymphs to match the seasonal hatches are all you really need on the Gibbon River. 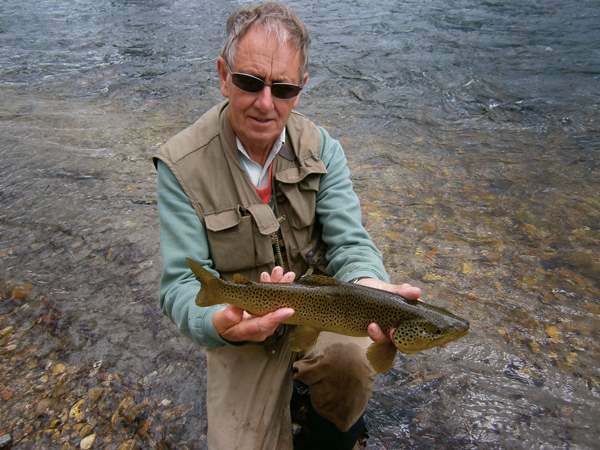 Trout are free rising on the Gibbon, and as this is a high-altitude river the 'dog days' syndrome is minimal. Fish of 12 to 15 inches are plentiful throughout the river system and a catch of ten in an afternoon should be a reasonable expectation for a competent flyfisher provided you steer clear of popular road-side spots where the many National Park visitors tend to congregate. There are hotels inside Yellowstone National Park and in West Yellowstone, just outside the Park. The Snake River, which rises in Yellowstone National Park, is a major tributary of the Columbia River. Just outside Last Chance, Idaho, is Big Springs, a magical place and one of the sources of the best known section of the Snake River – Henry’s Fork. 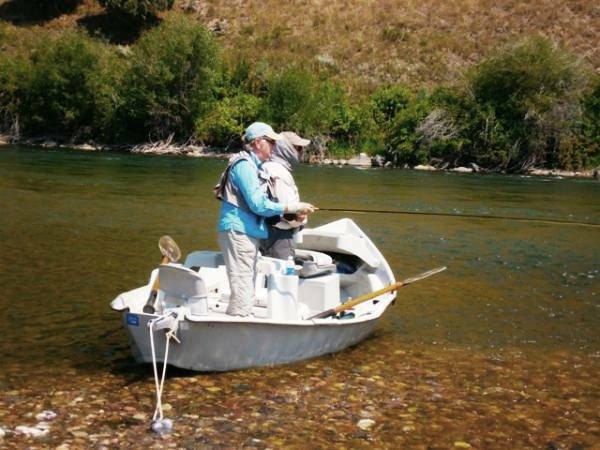 Brown trout, cutthroats and rainbows as well as mountain whitefish can be caught on the Snake River system. 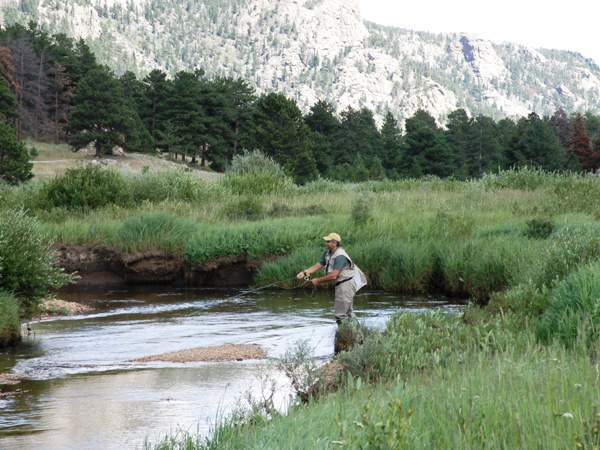 The most notable stretch of Henry’s Fork is known simply as ‘The Ranch’, a wide, slow stretch of water with a dense weed-covered riverbed which creates numerous mini-currents offering the ultimate challenge to the flyfisher. Along with a good population of smaller rainbows, it is home to large and ultra-wary specimen rainbows that will disappear at the slightest wading stumble or disturbance of the silty bed. Those flyfishers who attempt the ultimate challenge of The Ranch and are determined to adhere to the strictest ‘upstream dry-fly’ mentality will surely fail in their attempts to catch the big, 20-inch + fish: a dry fly cast downstream and slightly across (to avoid a flow of silt alerting the fish to your presence) will reach the fish before it sees the tippet and leader; this, we learned, is the surest route to success. Another notable stretch of Henry’s Fork is Box Canyon, where the water flows dangerously fast over big boulders. 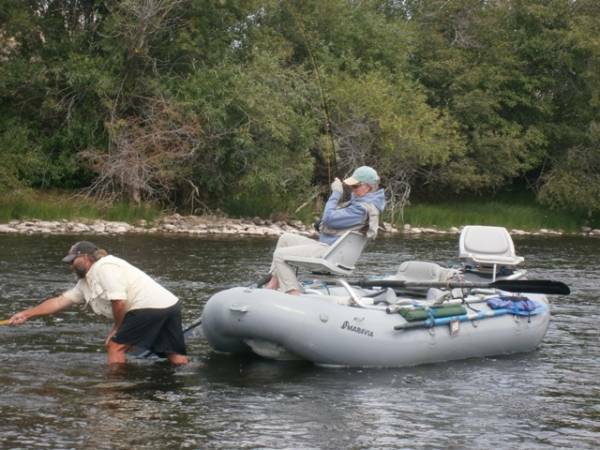 Wading is all but impossible there, and a professional guide with a boat is a necessity when attempting to catch the big, immensely strong rainbows that choose this inhospitable place to live. 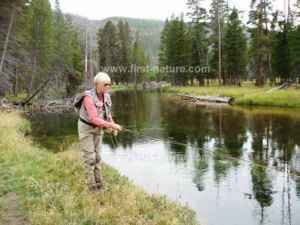 For The Ranch and other gentle stretches of Henry's Fork a 9ft AFTM #4 or #5 trout rod is ideal; and matching the hatch, when one occurs, is vital. Amongst the prolific hatches you may expect to see are Pale Morning Duns (PMDs as they are invariably referred to in the USA), Blue-winged Olives, Mahogany Duns and other up-winged flies, along with periodic massive hatches of flying ants on which the fish will often feed to the exclusion of anything else. In the afternoons when the prairie winds blow and put down the hatches, the use of imitations of hoppers, crickets and other terrestrials issometimes the best way to proceed. For Box Canyon, rather blunter instruments are required and big, ugly nymphs, bugs and streamers are key to success in catching the fish (if not in honing elegant casting skills!). Two or three fish over 16 inches in a half-day's fishing must count as a reasonable catch from this world-famous (and hence quite heaviliy pressured) river. Fortunately the American catch-and-release culture means that very few fish are killed, and so you can expect to see quite a lot of rising fish whenever there is a hatch. 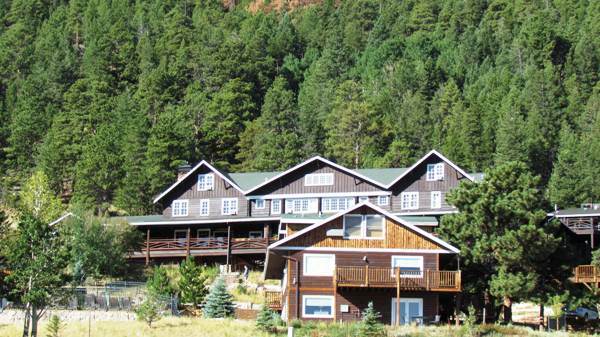 If you stay at Trouthunter Lodge, in Last Chance (Idaho) you will be ideally situated for fishing on the Henry's Fork. 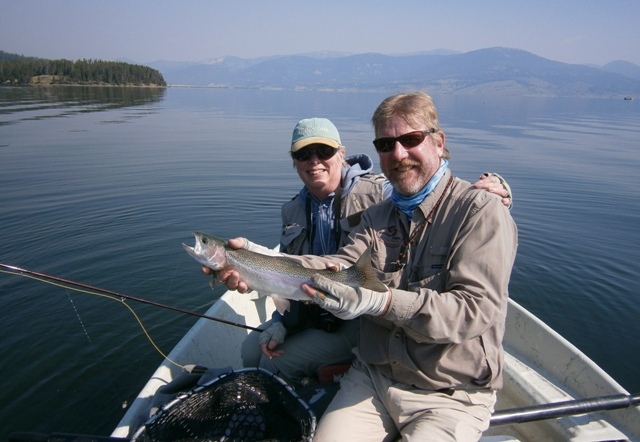 Licences for fishing in Idaho are available at Henry's Fork Anglers and Trouthunter Lodge. 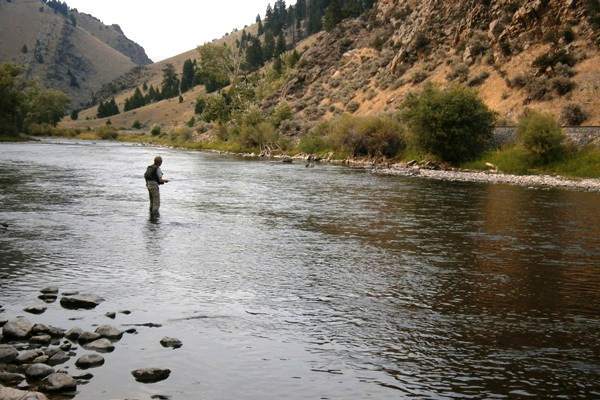 Less well-known, perhaps, than Henry's Fork the fishing on South Fork is just as good - some might say better. 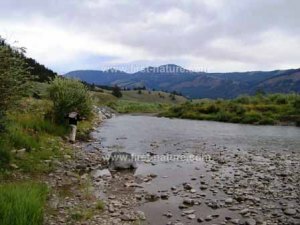 The special thing about this stretch of river is that it is populated with large numbers of native Cutthroat trout as well and Browns, Rainbows and White Fish.. The river is beautiful and the scenery and wildlife are spectacular. We met our guide at Henry's Fork and then drove for just over an hour to our access point on the river. The conditions were bright and sunny and the water was exceptionally low due to a prolonged spell without rain. The river has a wonderful variety of fishing habitats but, given the prevailing conditions, we concentrated our efforts mainly on the deeper riffles and channels on the pool tails to great effect. Walk-wading was the preferred method of fishing from some of the gravel banks which are common throughout the river and made a pleasant change from sitting in the boat all day. The Madison River is born in Yellowstone National Park, formed by the conjunction of the Firehole and Gibbon rivers. From there it heads off north for 140 miles linking up with the Jefferson and Gallatin rivers to form the Missouri. Just outside Yellowstone the Madison has been dammed to form a reservoir known as Hebgen Lake. Shortly after leaving Hebgen the river has been dammed again, not by Man this time, but by Nature: a major earthquake in 1959 caused a landslip that created Quake Lake. From there the river runs unimpeded for some 50 miles to Ennis Reservoir - there are no deep, slow-drifting pools - and throughout this long stretch the waters are fast and in places boulder-strewn. 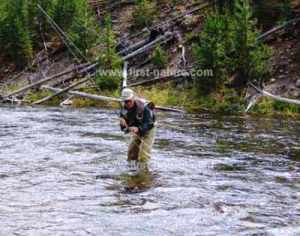 Wading on some stretches is challenging, but fortunately much of the river can be fished from the bank or by stepping into the shallow margins. Drift boats are allowed but they may only be used for getting from place to place: there is no fishing from the boats. 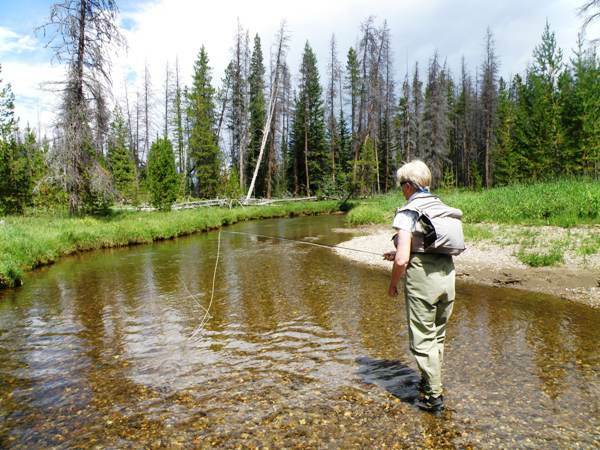 Although the Madison is home to several game fish species including Arctic grayling, brook trout, mountain whitefish, rainbow trout and Yellowstone cutthroat trout, for us the real attraction is the brilliant brown trout fishing. Fish to well over 20 inches lie against undercut banks and below drop-offs, where they will usually rise to dry flies that match the natural insects on the water; if not, nymph fishing such tricky lies can be great fun but far from easy. An AFTM #4 or #5 rod is ideal on calm days, but often in the afternoon a stiff prairie wind makes fishing with light tackle very challenging, and then we found a #6 rod a distinct advantage. Tippet strength of 4 lb breaking strain is quite fine enough, and in very fast water something rather stronger is not out of place. The perfect calm day for fishing Hebgen Lake, in the upper reaches of the Madison River. 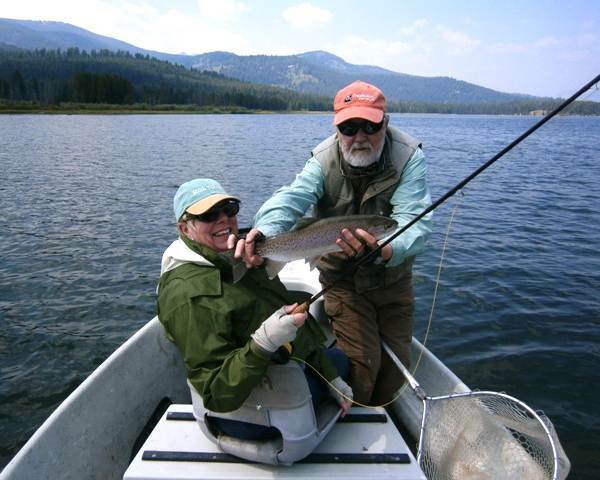 Sue O'Reilly with guide, Bob Lamm, and a good Rainbow. This lake is famous for fishing what the fishing guides refer to as 'gulpers' - Rainbows and brown trout which rise to Callibaëtis - grey-yellow mayflies that hatch in vast numbers from mid morning until the wind rises and effectively kills the fishing, at least as far as small dry flies are concerned. On a good day in July and August this lake can provide a frenzy of spectacular sport. The key to success is to judge the range and direction of rising fish and present your fly on their cruising line the right distance ahead of the previous rise. The ability to be able to either 'shoot line' or to lift and recast long lengths of line really pays off when fishing this lake. What a difference a day makes - after an exceptionally cold night and windier than ideal conditions on Hebgen Lake, other fishing tactics are explored with success. 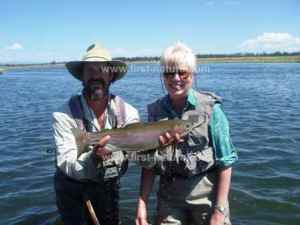 Sue O'Reilly and guide, Curt, with a large Rainbow Trout. If the weather is windier than ideal, good fishing is still available on Hebgen if you change the tackle setup. A large dryfly used as an indicator with one or two droppers tied in a line below it enable you to fish deeper when the fish are not rising. Although slower and less exciting than fishing one of the spectacular rises on the lake we still caught plenty of large fish using this method. 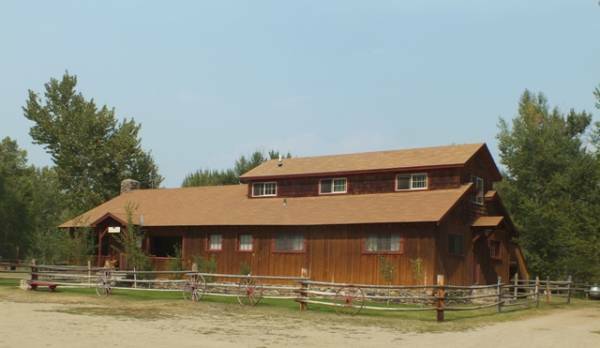 If you stay at Trouthunter Lodge, in Last Chance (Idaho) you will be ideally situated for fishing on the Henry's Fork and but a forty-minute drive from the Madison. Another option is to stay in one of the hotels in west Yellowstone, which makes the Yellowstone River and upper Madison equally convenient; you would then also have access to the many tributary streams within the Park. Note that separate licences are required for the Park (much of which is in Wyoming), for the rivers of Idaho, and for the rivers of Montana (including the Madison outside of Yellowstone National Park). Henry's Fork Anglers, also in Last Chance, have an extensive tackle shop, sell licenses and also provide expert fishing guiding for all the local lakes and rivers. Soda Butte Creek rises beneath Henderson Mountain, near Cooke City in Montana, and flows into the northeast corner of Yellowstone National Park; after flowing for more than 15 miles inside the Park it eventually joins the Lamar River. 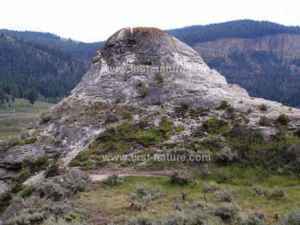 The river gets its name from an imposing geological feature - the Soda Butte, a calcium carbonate mound formed more than a century ago by a hot spring. Nowadays only very small amounts of hot water and hydrogen sulphide gas continue to flow from this once prolific hot spring. Not only is this a great fishery but it must rank as one of the most scenic rivers of Yellowstone National Park. Cutthroat trout and rainbows in the fast-fowing upper river are plentiful, and they average 10 to 12 inches long, but in the gentler pool-riffle sequences below Icebox Canyon and on down to the confluence with the Lamar River there are fewer but rather larger fish, typically around 14 inches in length. On slower stretches of the Soda Butte in the summer and early autumn months there are good hatches of Green Drakes, various Baetis species, and Pale Morning Duns (PMDs as they are known as in the USA); this means that there are usually plenty of rising fish to cast for. On hot breezy days live crickets, hoppers and beetles get blown in, so terrestrial imitations are also essential ammunition if you plan on visiting this river. Light tackle (an 8 ft or at the most 9ft AFTM #4 or 5 rod) and fine tippets are ideal for this lovely little stream. Distance casting is not required, but the upper river is a great place to hone your accuracy skills. In our two weeks in Rocky Mountain National Park we fished on three rivers and two of the many lakes within the Park: the Big Thompson River (referred to as the Big T), Fall River (Eastern side of the Park) and the Colorado River (Western side of the Park); Lily Lake and Sprague Lake (Eastern side of the Park). 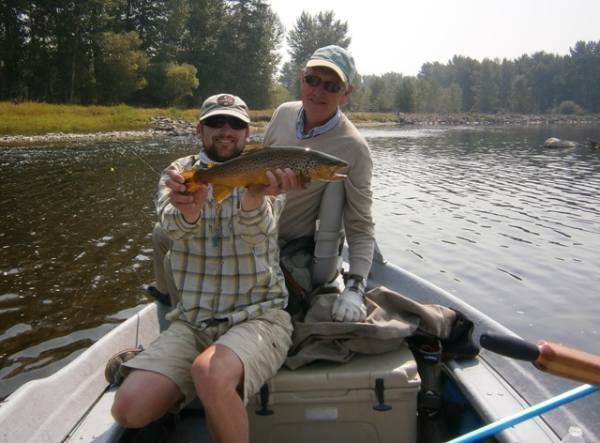 The fish species that we caught were Brown Trout, Brook Trout and Greenback Cutthroat Trout. The Brook Trout are small but beautiful, and they are found only in highly a few parts of the rivers that we fished. The Greenback Cutthroats and Brown Trout were much bigger, and we had some fine fish up to around 14 inches in length from both the 'Big T' and the Fall Rivers. This river reminded us of the Madison, which we fished in Idaho and inside Yellowstone National Park a few years ago. We always jokingly referred to the Madison as being a 75 mile riffle, and the Big T, although much smaller, is very similar. There are no slow bits; it really whistles along and has some very deep pools on the bends. The riverbed on the upper reaches of the Big T inside the Rocky Mountain National Park is boulder-free. This makes wading a far easier proposition than on the Madison, but the crystal clear water is deceptive:the water is both deeper and faster than you think, so care needs to be taken when stepping into or crossing the Big T.
We fished the Big T in Moraine Park, entering and leaving at different points each day until we had fished all the way up from opposite the Moraine Park Visitor Centre to the Cub Lake Trailhead car park. The middle part of this stretch was particularly good, and we had one day where the two of us caught 40 Brown Trout with a few lovely little Brook Trout thrown in for good measure. The Brook Trout seem to prefer slower water, and we found one particular little back-water that was full of them, resulting in a thoroughly entertaining half hour before we resumed the real business of the day, the Brown Trout. This was our favourite river of the trip, without question. We fished upstream from Cascade Cottages and found plenty of lovely Brown Trout and a few Brook Trout, too. 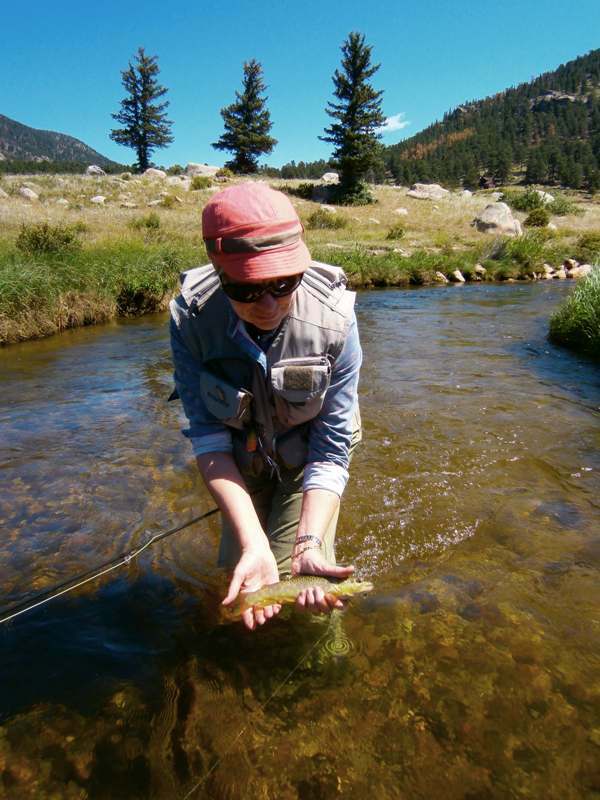 Fall River is as fine a river to dry fly fish as it is possible to find. The wading is a dream, the water is gin-clear, and it has a wonderful structure of pools and riffles. 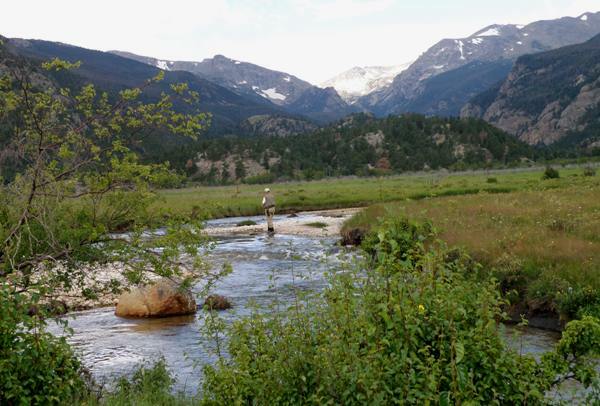 We would go back to Rocky Mountain National Park just to fish this one river again! The scenery is lovely and there is a good chance of seeing Elk and Moose in the riverside meadows, particularly during autumn time. We employed exactly the same tactics as we used on the Big T and with equal success, but with the slower pace of the river the fishing experience was much more relaxed and leisurely. It would be easy to spend an entire day wading slowly up this delightful stream, catching good-sized Brown Trout that lie under the banks in the pools and on the edges of riffles on the bends. A drive of around one and a half hours took us from Estes Park to Kawuneeche Valley to fish the Colorado River, which at this stage of its life is a lovely meandering stream flowing through meadows full of wonderful wildflowers. Again the scenery was mesmerising and the stream beautifully clear, low and easy to wade. The fishing in this area was the most disappointing of the trip, even though we were there at peak fishing time. The fish are small and few and far between, but the biggest problem was angling pressure: there were far too many people fishing, and their chosen method seemed to be spinner fishing which seemed to us to be a totally inappropriate and ineffective method given the low and clear water conditions. Despite moving and trying several different places our luck did not improve. We soon gave up and enjoyed a wonderful afternoon photographing the lovely scenery, plants and wildlife remembering our motto: a day spent fishing in a beautiful place can never be described as a blank! We looked at several of the fishing lakes in our immediate area, but we chose to return to Lily Lake most evenings to fish the evening rise, which was spectacular. This lake was very close to where we were staying; the scenery was amazing; and the prolific wildlife kept us entertained while we were waiting for the evening rise to begin. Apart from the many birds on the lake and the lovely flowers on the banks, there were numerous Muskrats which seemed completely unperturbed by the presence of anglers and continued their busy lives despite us. This kind of fishing is great fun - targetting rising fish with a dry fly and having them take it is probably one of the most satisfying ways of spending an evening. Almost without exception the wind dropped around 7pm and shoals of cruising Greenback Cutthroats started to feed on hatching insects. While the light was still good, we fished mainly with smallish flies - around size 16 - but once the sun had set we changed to much bigger sedge patterns - size 12 at least. One of these sedges cast out on to the completely calm water and then twitched or moved slowly across the lake produced numerous explosive takes from good-sized fish - up to 14 inches. We fished Lily Lake until it was too dark to see to release the fish or tie on new flies - and the call of our hosts' excellent whisky could no longer be denied! Our absolutely preferred method of flyfishing is 'upstream dry fly', and this proved to be a suprisingly unusual technique with the other anglers that we encountered on the rivers, given that the water height and clarity were perfect for this style of flyfishing. The beauty of this technique is that you can come up behind the fish and target the larger specimens in their preferred lies with less danger of being seen by them. We often use a small nymph tied trailer-style beneath the dry fly, but the readiness of the fish to rise to a dry fly meant that this was largely a 'tactic too far' and simply unnecessary. The most important thing was to get the fly into the lies without spooking these heavily fished-for, wily trout. 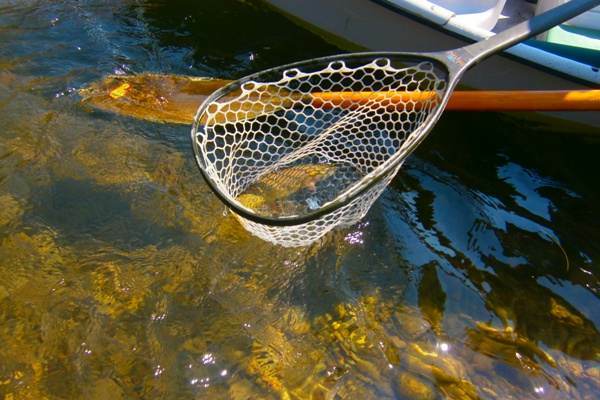 Light tackle (AFTM #4 or #5 rod) and fine tippets are ideal for these clear-water rivers and lakes. Dry flies and small nymphs to match the seasonal hatches are all you really need on calm days, but when the Rocky Mountains winds get up big hoppers get blown onto the surface and a suitable imitation can provide explosive sport. Choice of fly was seldom an issue (bad news for the local tackle shops! ), but we mainly fished with dry flies around about size 14 to 16 during the day (a Parachute Adams is a particular favourite) and then switched to large (size 12) sedgefly imitations in the evenings. The latter were extremely effective for the evening rise on Lily Lake. Given the lateness of our visit (late August) there were few insect hatches, and so trying some large 'terrestrials' such as hoppers and crickets proved very successful in the windy conditions that often prevailed in the afternoons. Fishing the rivers inside the National Park is challenging: they are very heavily fished during the summer season making the fish very wary indeed; the water is so clear that the fish can spot you a long way off, making stealthly movement essential; and finally, the howling winds that can spring up in the afternoons make accurate casting a challenge for even the most seasoned and experienced of fly casters. 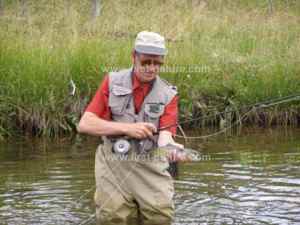 For beginners there is a multitude of lakes with excellent fishing, abnd this makes life a lot easier while still developing the skill of casting. Upstream dry fly fishing is the most difficult of the techniques to master, but it is far more successful than the 'across and down' method most frequently employed on rivers which, unless you are lucky enough to land the fly on the nose of a large trout hiding under the far bank of a stream, simply targets the tiddlers in the shallow edge of the river as the fly and line sweeps across the water. Line control is the main problem with upstream fishing because the current causes the fly to rush back towards the angler, but practise makes perfect and this technique is well worth perservering with and results in far larger fish being caught in the long run. 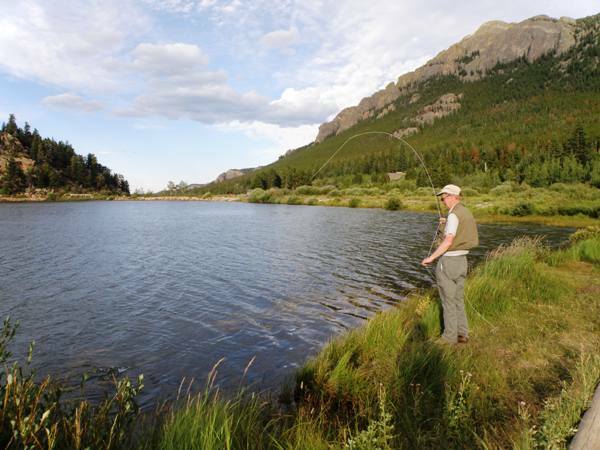 If part of your judgement of the success of a fishing trip is that you should be doing it in dramatic and beautiful scenery then flyfishing in Rocky Mountain National Park in Colorado is difficult to beat. Access to Rocky Mountain National Park can be on a daily, weekly or annual pass basis. As we planned to visit the park every day of our stay by far the cheapest option was to buy an annual pass, which cost us $40 and gave us a swipe card allowing us to use a dedicated card lane at the park entrance and thus avoid the queues of daily visitors, which were more lengthy at weekends although never too onerous. We flew to Denver on a direct flight from London, and as we drove north from the airport it was not long before we could see the Rocky Mountains rising in front of us. Our destination was Estes Park, a charming little town dominated by dramatic peaks of the Rockies and situated just outside the eastern edge of the Rocky Mountain National Park. It's around a two-hour drive from the airport, much of the journey being through the mountains, although we missed much of these scenic delights due to our relatively late arrival. Our accommodation for both weeks of our stay was at The Promontry, a luxury development of lodge-style houses just outside the town centre. We stayed in LakeHaus, which was a delight and an education in style and comfort. Sleeping parties of six to ten people with three double bedrooms (one ensuite) and with a separate shared bathroom for the other two, plus another toilet, there were no bathroom conflicts at all! For parties larger than six, or for those requiring more beds, the enormous sofas in the two lounges convert into queen-sized beds. The Promontry is situated immediately above Marys Lake and a is five-minute walk from Marys Lake Lodge, which has guest accommodation and rental holiday homes available as well as being a fine place to eat, drink and relax after a hard day's fishing. There are two restaurants in the Lodge - one in the bar, where there is often entertainment laid on, and a separate formal dining room where you can relax and enjoy eating without the hustle and bustle of the bar area. The food we had there was excellent. During our stay in Estes Park we also ate in the Twin Owls Steakhouse, one of the top restaurants in the town. Much more than just a steakhouse, the menu (they specialise in some of the local game) and atmosphere of this lovely restaurant make it an absolute 'must' if you feel like a special treat during your stay. The Rocky Mountains are famous for their opportunities to enjoy outdoor pursuits including hiking, riding, cycling, fishing or just wildlife-watching in spectacularly beautiful scenery. Road access in the park is excellent, and if you are not travelling in by car each day, there are very regular shuttle buses from Estes Park which carry visitors from one location (including visitor centres and trail heads) to another within in the park. There are several Visitor Centres spread throughout the park, helping you to get the most out of their particular area; they are staffed by enthusiastic and knowledgeable Rangers, who can tell you the best places to visit to see wildlife or to enjoy your chosen activity. 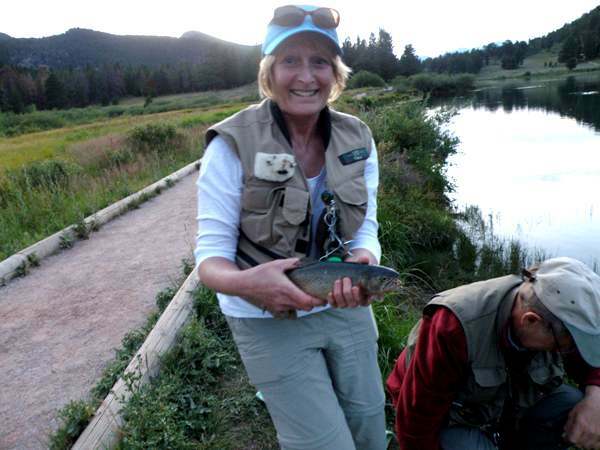 We count the fishing trip to Rocky Mountain National Park as one of the finest and most enjoyable that we have ever made, and we very much hope to return in the not too distant future. Information about where to fish in the Park is easy to come by. The various Visitor Centres throughout the area are manned by real experts on the subject, many of whom fish. There are also two excellent Fishing Shops in Estes Park - Kirks in the town centre, and Scot's on the main road in to the Park. Apart from being treasure troves of fishing tackle, they also sell fishing licenses and are more than happy to advise visitors on the best places to enjoy fishing throughout the Park.